As iconic sedans go, there are few competing models that can match the track record of the legendary Mazda6. Now improved and enhanced for the new model year, the 2017 Mazda6 offers buyers something rarely found: an efficient, spirited model that is as easy on the eyes as it is on the pocketbook. This terrific addition to the segment, with a quiet and serene interior and expressive exterior lines, continues to impress its buyers, even as it enters its third generation. Powered by a standard 2.5L four-cylinder engine rated for 184 horsepower, the 2017 Mazda6 is a confident and muscular midsize sedan of the highest order. Yet, with its innovative SKYACTIV®-VEHICLE Dynamics with G-Vectoring Control, it rewards drivers with up to 35 highway mpg. 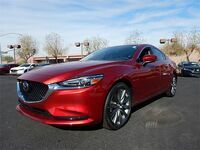 Phoenix-area drivers have come to expect this sort of performance from Mazda, and they can now experience this model for themselves at Avondale Mazda. Once inside the 2017 Mazda6, as many as five adult occupants are treated to an interior cabin that is thoughtfully constructed, yet exceptionally distinct from competing models. Available high-grade Nappa Leather seating is uniquely welcoming, while the power-sliding moonroof allows the elements to be experienced up close. Meanwhile, with the available BoseⓇ 11-Speaker Surround Sound System providing the music you enjoy most, the new Mazda6 acts as your home away from home. The technology of the 2017 Mazda6 extends to its offered safety features, which are best exemplified by its available i-ACTIVSENSEⓇ safety innovations, headlined by lane-keep assist, advanced blind-spot monitoring and traffic sign recognition. 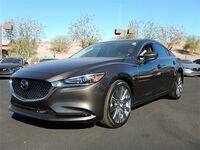 With all Mazda6 trims coming with a standard MAZDA CONNECT™ infotainment system, there’s little doubt that buyers of this model enjoy a heightened sense of satisfaction. The 2017 Mazda6 is now available at Avondale Mazda, located near Phoenix in Avondale, AZ. To learn more or to schedule a test drive, visit our dealership today!